Syllabus of the Online Course (Subject): Sharia (Islamic Law or Law of the Quran). The Sharia (“what is prescribed”), is a set of rules that govern the entire existence of a Muslim. Therefore, for a Muslim, it may be tough to accept the Western concept of separation between State and Church. It is crucial to understand this point. Sunnah: The second source of the Sharia. The Sunnah contains the religious actions and quotations of the Prophet Muhammad narrated by his fellows (Sunni branch) and Imams (Shi'a branch). According to the Sunni School of law, the secondary sources of the Islamic law are Ijma or the consensus of the Islamic Community (Ummah) and Itihad (an individual effort to reflect). The Sharia, or Islamic Law, covers a broad range of topics (Economics, Banking, law, health, or family relationships), its implementation depends on each country. Traditionally the “Sharia Courts” are not dependent on lawyers since the plaintiff, the defendant has represented themselves. Having the testimony of a witness is more importance than a written proof; it is evident that a contract has much less importance than a verbal agreement. This is an issue that we should never forget when doing business in countries that wholly or partially implemented Sharia Law. In the history of Islam, the Sharia has always coexisted with other legal systems. Today, few Muslim Countries apply strictly and comprehensively the whole code of the Sharia; many only apply some aspects of the Sharia. In principle, in all those countries where the Sharia is applied, total or partially, shall apply only to the Muslims; other religions should have a different law. For business, the Sharia should not affect an exporter directly in the foreign trade operations. However, the Sharia can affect the pricing policy, product, or promotion. It may also affect when opening a branch or hiring local Muslim workers. Sulaiman Al-Rajhi created the Al-Rajhi Bank one of the largest Islamic banks, offering products and services according to the Sharia principles. 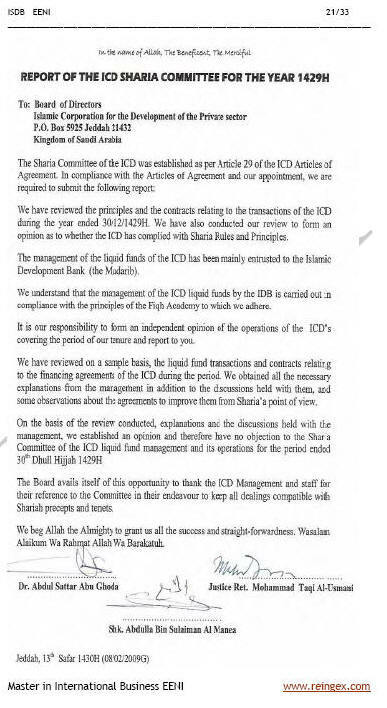 The International Bank of Kuwait (Bukhamseen Group) is an excellent example of the Sharia Supervisory Board. Arab Trade Financing Programme (ATFP).